Good Food, Good Cheer, Great Beer! With walls displaying local Te Awamutu happenings, heroes and villains, and bottles of Jameson whiskeys, it provides a comfortable 'at your mate's place' feel. With an ever-changing seasonal menu with legend dishes like the famous Kahawai Chowder, mouthwatering Angus Beef Steaks and Duo of Lamb, it will surely tingle your taste buds and fill your hungry tummy. The thirsty can also enjoy a range of New Zealand wines, fantastic variety of tap beers, including the Monteiths range and international favourite Heineken, to the ones closest to the heart such as Jameson Irish Whiskey. 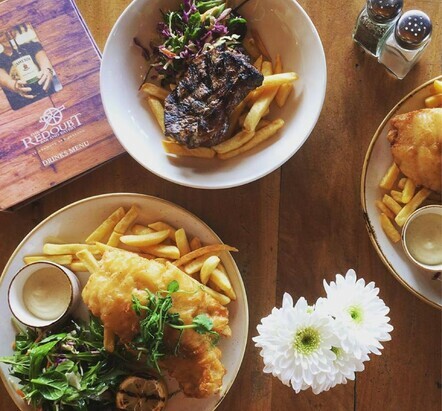 If you want an experience -- a uniquely Redoubt experience -- call in at The Redoubt Te Awamutu and book your tables. The Redoubt was established in 1999 by Michael and Faye Henderson, who wanted to "buck the trend" which was then to open Irish, English or Belgian themed bars. They did so by opening a Kiwi bar with a spice of local history. But then.....what is a redoubt? Redoubts are fortifications or camps used during the local fighting between the Maori and Europeans in the 1800's. 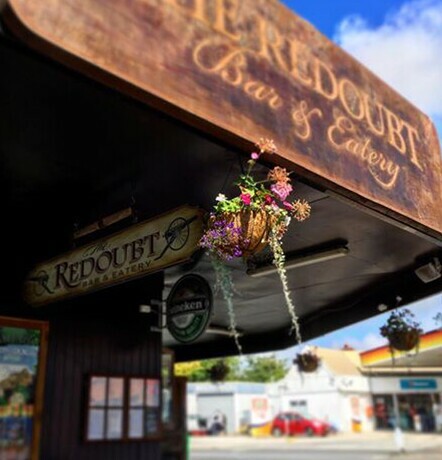 The dictionary meaning of 'redoubt' is 'a safe haven or a place of refuge,' which is quite apt really as the bar now serves to uplift the weary by bringing good food, good cheer and great beer to the locals and visitors of Te Awamutu.